The Rockford IceHogs introduced the Rock River Valley to professional hockey in 1999. The IceHogs, (then) as members of the United Hockey League, played its first game on Oct. 15, 1999, against the Knoxville Speed at the (then) Rockford MetroCentre. Rockford’s franchise was purchased and relocated to Northern Illinois from Thunder Bay, Ontario by United Sports Venture. 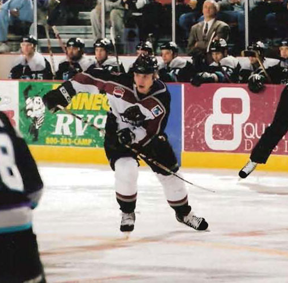 USV launched a ticket drive on March 3, 1998 to gauge the interest in professional hockey in Rockford. Just over 19 months later, the IceHogs debuted at the MetroCentre. The team name was selected by Rockford residents as a part of a fan poll held in conjunction with the Rockford Register Star. The name “IceHogs” beat other finalists including Rhinos, Mighty Oaks, Roughnecks, Ice Rangers, Rockets and Ricochet. The name was submitted by Belvidere resident Breanna Roush. The IceHogs won their first ever game 6-2 over the Speed led by Brant Blackned’s hat-trick. Rockford was led by Head Coach Dale DeGray for its first two seasons. After serving behind the bench for two seasons, DeGray was replaced by Scott Bell in 2001-02. Bell led Rockford for a season-and-a-half, before Scott Burfoot took the reins and led Rockford into the postseason for just the second time club history. Burfoot also played in three games for Rockford in 2002-03 before getting named head coach. On Oct. 23, 2002 Tri-Vision Sports LLC, led by Rockford businessmen Jim McIlroy, Jeff Smith and Dr. Kris Tumilowicz announced that they had purchased the IceHogs from USV. The trio purchased the team with the goal of keeping it in Rockford after several threats from USV to relocate or disband the franchise. On August 20, 2003, the IceHogs announced a partnership with the Rockford Park District and formed the Jr. IceHogs youth hockey program. The in-house youth hockey league plays at both public ice rinks in the Rockford area, Riverview Ice House and Carlson Ice Arena. Former IceHogs player and coach Scott Burfoot runs the program through the Rockford Park District. Mark Bernard was named the fourth Head Coach in four seasons in 2003-04 and was behind the bench until March 20, 2004 when he was replaced by Tim Mattila under an interim basis. The early seasons of IceHogs hockey were built on cornerstones like J.F. Rivard, Mike Figliomeni, Dan Davies and Steve Cygan. 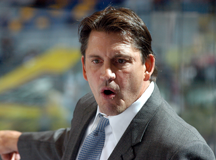 On June 17, 2004, Steve Martinson was named Head Coach and Director of Hockey Operations of the IceHogs, bringing Rockford its first true contender. In Martinson’s first season at the helm of the IceHogs, the team compiled a record of 46-25-9, a franchise best for wins, and qualified for the postseason for the third time in the team’s first six seasons. The IceHogs won their first ever postseason game on April 15, 2005, 3-0 at Kalamazoo over the Wings. Rockford went on to defeat the Wings in six games before falling in Game 7 of the Western Conference Finals, 2-1 in overtime, against the Fort Wayne Komets. The IceHogs built a 3-1 series lead before dropping the final three games of the series, including two in overtime. 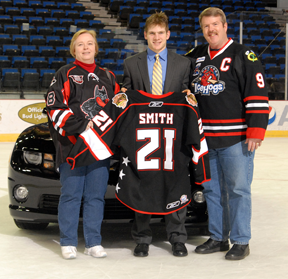 Following the 2004-05 season, Tumilowicz announced that he had bought out McIlroy and Smith and that he added Craig Drecktrah to the IceHogs’ ownership group. The 2005-06 season still stands as Rockford’s most successful regular season record-wise in club history. The IceHogs carried a 48-19-9 record into the postseason, but for the second straight campaign failed to get out of the Western Conference Finals, getting swept by Kalamazoo in four games. On Dec. 13, 2005, the IceHogs announced that they had signed their first ever affiliation agreement. The team became the UHL affiliate of the NHL’s Nashville Predators and AHL’s Milwaukee Admirals. At the time, they were the only UHL team affiliated with an NHL franchise. In recognition of the organizations success on and off the ice, the IceHogs were named the UHL’s Member Club of the Year for the 2005-06 season for the second straight season. Rockford spent eight seasons in the UHL and won its first championship on May 24, 2007. The IceHogs, led by Martinson, topped the Kalamazoo Wings in seven games with the series clincher at the MetroCentre. Rockford beat Kalamazoo 3-1 to take home the Colonial Cup in front of an IceHogs postseason record 6,236 fans. The game marked the final ever UHL contest. Prior to the 2007-08 season, a new era of history began in Rockford as the IceHogs made the jump to the American Hockey League as the top affiliate of the Chicago Blackhawks. On March 19, 2007, the AHL Board of Governors unanimously approved the sale and relocation of the inactive AHL franchise in Cincinnati, owned by Gardens Hockey Inc. to Rockford. The announcement was made by Blackhawks General Manager Dale Tallon and AHL CEO Dave Andrews at the Rockford MetroCentre. Beginning in ’07-08, the IceHogs entered its first year of an unprecedented 10-year affiliation agreement with the Blackhawks. Mike Haviland was officially named the first Head Coach of the AHL IceHogs on July 5, 2007. Rockford’s first AHL game was played on October 6 in Quad City, a 5-1 loss to the Flames. Haviland guided the IceHogs to a 44-26-4-6 record in the team’s first AHL season, qualifying the club for the Calder Cup Playoffs. Rockford defeated the Houston Aeros 4-1 in the best-of-seven West Division Semifinals series. The lone loss was a 1-0 double overtime defeat, the longest scoreless hockey game in AHL history as Ryan Jones scored on Corey Crawford after 86:57 of scoreless hockey at the MetroCentre. In their first AHL season, Rockford came up short in the West Division Finals against their new-found rivals, the Chicago Wolves. After Rockford grabbed a 3-2 series lead in the best-of-seven set, the Wolves stole wins in Games 6 and 7 to win the series en route to their second Calder Cup Championship. After his third successful season behind the bench of the Blackhawks top affiliate (including two with the Norfolk Admirals), Haviland was promoted to assistant coach of the Blackhawks. On August 1, 2008 Bill Peters was named the eighth Head Coach in club history and second during the team’s AHL era. Rockford qualified for the Calder Cup Playoffs in each of Peters first two seasons, stretching the seasons of postseason hockey to six straight in the Forest City. During that six season stretch, the team won at least 40 games each year. After bowing out of the playoffs in the first round in 2009 and 2010, the IceHogs missed the postseason all together for the first time in six years in 2011. Despite missing the playoffs in 2010-11, Rockford finished the campaign with a record of 38-33-4-5. The 2010-11 season also established a new high-water mark for attendance as the franchise eclipsed the 4,000 fans per game mark for the first time. On average, 4,360 fans passed through the turnstiles at the Rockford MetroCentre, a total of 175,418 overall in 2010-11. After accepting the assistant coaching position with the Detroit Red Wings on July 8, 2011, Peters was replaced behind the Rockford bench by assistant IceHogs coach Ted Dent on July 20, 2011. A new coach wasn't the only change around Rockford before the start of the team's 13th season as the home of the IceHogs, the Rockford MetroCentre, was renamed the BMO Harris Bank Center on August 11, 2011. After a rough first half of the 2011-12 campaign, the IceHogs rebounded with a second half record of 21-12-1-4, but for a second straight season came up short in their bid to qualify for the postseason. The 2012-13 season began with the NHL lockout, putting six Blackhawks skaters in Rockford for the first-half of the campaign. After the lockout ended, Rockford finished '12-13 as one of the hottest teams in the AHL, but fell one win shy of the Calder Cup Playoffs. In doing so, the IceHogs became the first team in the 77-year history of the AHL to win 42 games in the regular season and not make it to the postseason. Center Brandon Pirri became the first player in IceHogs history to lead the league in scoring as he paced the AHL with 75 points (22g-53a) in 2012-13. After another successful season in 2013-14 which saw the IceHogs finish above .500 for the 10th straight season, the Hogs also set a then all-time attendance record with 182,540 fans visiting the BMO Harris Bank Center for 38 home games. Once again, the IceHogs had another banner year both on and off the ice in 2014-15. Rockford set AHL franchise records in points (99), wins (46), road wins (22), winning percentage (.651) and returned to the Calder Cup Playoffs for the first time since 2010. After a sweep of the defending Calder Cup Champion Texas Stars, the IceHogs were bounced in the second round of the playoffs. However, the Hogs enjoyed the success of the big league club as the Blackhawks went on to win their third Stanley Cup in six seasons, and included contributions from 12 former IceHogs. For the 12th straight season, the IceHogs finished above .500 at the conclusion of the 2015-16 campaign. The 15-16 season was one that featured many record shattering moments. Among the most notable on the ice was goaltender Michael Leighton's record breaking performance on March 5 against Lake Erie. With a 5-0 blanking of the Monsters, Leighton registered his 46th career AHL shutout and snapped Johnny Bower's 59 year-old record for most career shutouts. The success on the ice carried over at the gates as well as the IceHogs set another overall attendance record with 190,492 fans visiting the BMO Harris Bank Center in 2015-16. The IceHogs hosted a franchise-best 11 sellouts during the season and averaged over 5,000 fans for the first time in team history. In the offseason, the Blackhawks and IceHogs agreed on a five-year affiliation extension which ties the two clubs together through the 2021-22 season. Overall, 88 different IceHogs skaters have appeared in the NHL, including 66 with the Blackhawks. The list includes 22 players who were members of the 2010, 2013 and 2015 Stanley Cup Champion Blackhawks teams including: Bryan Bickell, Dave Bolland, Brandon Bollig, Nick Boynton, Troy Brouwer, Dustin Byfuglien, Corey Crawford, Kyle Cumiskey, Scott Darling, Colin Fraser, Jordan Hendry, Niklas Hjalmarsson, Marcus Kruger, Nick Leddy, Antti Niemi, Joakim Nordstrom, Brandon Saad, Andrew Shaw, Ben Smith, Teuvo Teravainen, Trevor van Riemsdyk, and Kris Versteeg. The first player to use Rockford as a launching pad to the NHL was winger Raitis Ivanans. Ivanans played with the IceHogs during the 2002-03 season and for one-game in 2003-04. The rugged winger made his NHL debut with the Montreal Canadians on Oct. 8 2005 at Toronto against the Maple Leafs. Ivanans has also played with the Los Angeles Kings and Calgary Flames in the NHL, totaling 282 career games. The IceHogs organization has established itself as a staple in the Rockford community. As the longest running sports team in Rockford, the IceHogs pride themselves with its work in the community through the IceHogs Charitable Foundation and as the premiere choice for entertainment in the Forest City. An annual charity jersey auction has helped the IceHogs raise over $890,000 that benefits local non-profit charity organizations in the Rockford area. The team, including players, coaches, front office members, and mascots, made nearly 200 community appearances in 2015-16. For more information about the IceHogs, contact the corporate office at (815) 986-6465. The IceHogs team name was selected by fans through a promotion in the Rockford Register Star. 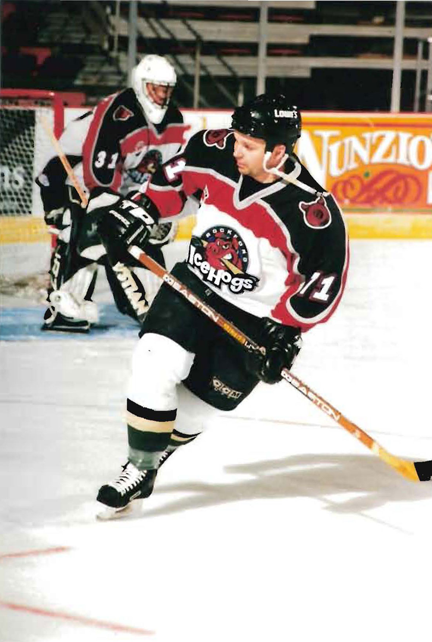 Scott Burfoot both played and coached the IceHogs during the team's UHL era. Steve Martinson was named Head Coach and Director of Hockey Operations on June 17, 2004 and led the IceHogs to their first league championship. Rockford won the UHL's Colonial Cup Championship following the 2006-07 season in seven games over the Kalamazoo Wings. The IceHogs inked a 10-year affiliation agreement with the Chicago Blackhawks on March 19, 2007. That deal was extended another five years on June 16, 2016, securing an affiliation with the Blackhawks through the 2021-22 season. The IceHogs made their AHL debut on Oct. 6, 2007 against the Quad City Flames. 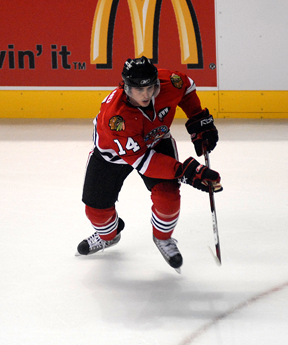 Dave Bolland (pictured above) was the first IceHogs player to get recalled to the Blackhawks. 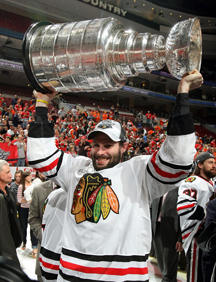 Troy Brouwer was one of 10 former IceHogs that were members of the 2010 Stanley Cup Champion Chicago Blackhawks. Raitis Ivanans was the first former IceHogs player to play in the NHL. The rugged winger played for the Montreal Candians, Los Angeles Kings and Calgary Flames. The IceHogs hold an Annual Jersey Auction each season and the event has helped raise over $890,000 for local charities during the first 17 years. The IceHogs set a franchise attendance record in 2015-16 with an average of 5,009 fans during the team's 38-game home schedule. 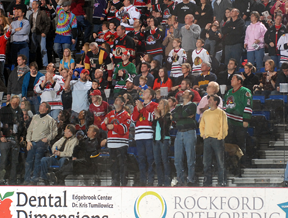 It marked the first time that Rockford averaged over 5,013 fans per game for an entire season.